Remember last December when there was all the doom and gloom about the decline in ereader shipments? Many blogs reported it as a sign of the end of the ereader market, but given the latest survey data from Pew Research Center that's probably not the case. According to the PRC over a quarter of Americans adults owned an ereader in January 2013. It seems that reports of the death of the ereader were greatly exaggerated. This data comes not from the survey on American libraries or the report on US reading habits. Instead a helpful soul with the Pew Research Center pointed me at the reports and survey data that Pew has been gathering in their study of America's mobile shopping habits. The January survey data shows that 31% of Americans now own a tablet of some kind, be it iPad, Android, or iPad. That's up slightly from the 25% who reported the same in November 2012. That is an excellent growth rate, even though it is far less spectacular than what was reported this time last year (from 10% before Christmas to 19% after Christmas). But never mind tablets; the important news today is ereader adoption. According to the most recent survey conducted in January, a full 26% of American adults now own an ereader. That's up from the 19% who owned them back in November. Let's look at those numbers. According to the survey data ereader ownership got a 9 point bump last Christmas and a 7 point bump this Christmas. That's not exactly what I would call a sharp decline, and it is not anywhere close to resembling iSuppli's prediction that ereader shipments would drop by a third in 2012. In fact, if we factor in the estimated sales in markets other than the US, for example the 1 million ereaders sold in Germany in 2012, I would not be willing to argue that ereader shipments dropped at all in 2012. Furthermore, I think I now see why E-ink predicted in early January that ereader shipments would increase in 2013. They had probably already gotten early data on ereader sales over Christmas, and that data probably showed exactly what I just told you. It seems that reports of the death of the ereader were greatly exaggerated. The hard-core readers and book buyers are still adopting ebook readers. The numbers might not be going up as fast as before but they're still going up. And this explains the B&N Nook “giveaways”? 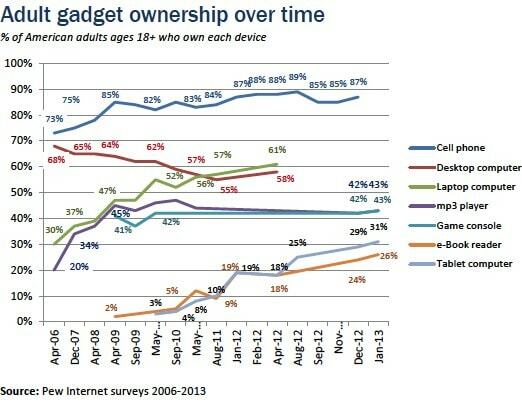 “Ownership” of e-readers will expand even if/when the rate of new device sales reaches a plateau in some markets. I know many an e-reader whose first e-ink device came to them as the hand-me down (or hand-me up) when a parent, sibling or child got a new device. My 1st e-reader (K2) is now “owned” by my sister. It was originally lent to her hubby, the more avid reader of the pair–he now owns a new PW, and she asked to hang on to the K2 to use herself. No one throws away a perferctly good e-reader. If you have another device to use as back-up (phone or iPad), you might as well give the old e-ink device away or sell it while it still has some $$ value. Perhaps it’s wishful thinking, but my fingers are crossed that the Kindle e-inks hang on for a while yet. My family and I love their simplicity, and our ability to read the screens easily in bright sunlight. We travel abroad full-time so these little devices—with their long-battery life, low price, and light weight — are perfect for us. Ereaders are such wonderful inventions for those who actually want to read books. Tablets, with their horrible glossy lcd screens can not at all deliver the comfortable reading experience an ereader can. Unless a new kind of multipurpose screen can be developed I predict a very good future for e-ink type reading devices.